Pokeworks will bring a taste of Hawaii to Arsenal Yards. Boylston Properties and The Wilder Companies announced today that with construction underway, Pokéworks will bring Hawaiian-inspired eats to Arsenal Yards in 2019. The international, fast-casual concept will join Arsenal Yards’ lineup of diverse food offerings including cult-favorite Shake Shack and New England’s first City Works Eatery and Pour House. By 2020 Arsenal Yards will be a thriving new neighborhood comprised of over more than one million square feet of development including 250,000 sq. ft. of curated shops, eclectic eateries, fresh groceries from Roche Bros., and a seven screen cinema, The Majestic at Arsenal Yards, plus 200,000 sq. ft. of new and existing creative office and life science space, 425 contemporary residences, and a 146-room Hampton Inn & Suites by Hilton. The development will also include dedicated green space, access to a revitalized Arsenal Park, connection to the Watertown-Cambridge multi-use pathway and an accessible pedestrian/bicycle path to the Charles River. 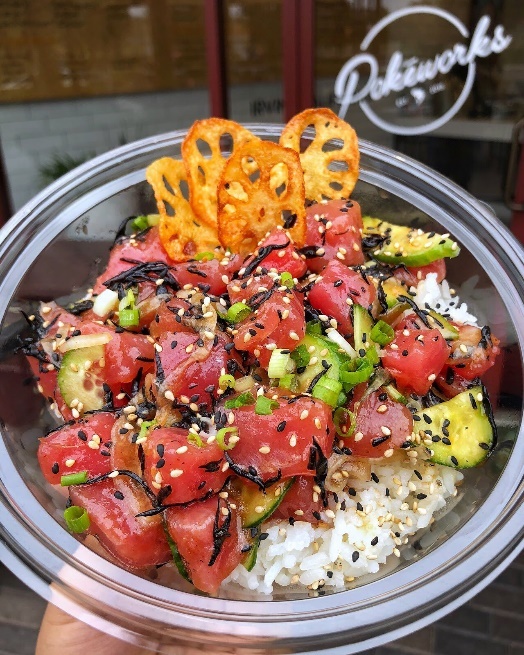 Pokéworks was created out of founders who shared a passion for Hawaiian poke and a vision of bringing fresh, flavorful poke from Hawaii to the Mainland. Today, Pokéworks has expanded internationally and continues to bring an authentic taste of the islands around the world using fresh, sustainable, seasonable and natural ingredients. Created using only responsibly-sourced, premium seafood, menu highlights include something for everyone, from traditional Hawaiian poke to celebrity chef-inspired specialty bowls and “Poke Your Way” custom poke burritos, bowls and salads. Pokéworks at Arsenal Yards will have a bright and airy feel, showcasing natural wood and muted accent colors that complement the vibrant colors natural to the food on display. Dramatic angles will be utilized throughout the space to reflect that “poke” by nature means to cut/slice. Light fixtures and finishes will have a subtle nautical theme to evoke the seas and water where poke comes from. All material used will reflect Pokéworks‘ commitment to sustainability and natural ingredients. Boylston Properties is a Boston-based real estate developer of mixed-use places including retail, residential, hotel, corporate, and lab buildings. With four decades of experience and a contemporary vision, our distinctive projects have become part of Greater Boston’s new urban landscape. With over 30 years of experience and a contemporary vision, many of Boylston’s high visibility projects have become part of the new urban landscape in metro Boston. For more information, please visit www.boylstonproperties.com. Founded in 2015, Pokéworks is the nation’s largest and fastest growing poke brand in North America with nearly 20 locations open and more than 100 under development. The brand provides a fresh take on Hawaiian-inspired poke burritos and bowls, using the highest quality ingredients from local waters. Its chef-driven menu allows for complete customization that caters to almost anyone including those maintaining gluten-free, nut-free, vegetarian, vegan as well as cooked or raw protein diets. For more information about Pokéworks please visit www.pokeworks.com. Pokéworks is not an interesting addition judging by their menu. Have you tryed the Pokeworks in Harvard Square? Kind of like the Chipoltle of raw fish, it was busy and I loved my double salmon roll. Sweet Greens would be my vote. How can we encourage some of that new resident dollar flow into small locally owned businesses? Our local prosperity will be increase if money cycles through the community a few times before being swept back into some large corporate coffer. The new and locally owned self storage facility coming to East Watertown will be a big help to small startups. Just yesterday I heard that the new Joyfull Garden Chinese Restaurant (also locally owned) coming to the Watertown Mall is in need of storage space. What a great time to be living in Watertown! Pokeworks is great, but I agree that Sweet Green might be an even better choice if you want a business that caters to millennials looking for healthy dining options. Dig Inn is fantastic as well. That said, I’d love to get some locally owned businesses into AY. FoMu would be awesome. It’s made right around the corner. Let’s get an Armenian food spot in here too. Fresh lamejun and platters with moussaka and Armenian string cheese would be amazing! A place like this would also differentiate AY from every other development of this type in the area. Perhaps a small Fastachi “satellite” location would be great as well. They carry amazing products, have beautiful displays and have deep Watertown roots. Damian I am enjoying your comments. I am now thinking about how East Watertown is going to have potential for tourists. Between Coolidge Square and our wonderful Armenian Community and also our industrial innovation history reflected into Arsenal Yards and Arsenal on the Charles. Now that Athena has been bought, hopefully we will see that plan completed as well.